This themed slot from Novomatic is a diamond of a slot game, fit for the beautiful blonde bombshell herself! Marylin Monroe loved all of the finer things in life, especially diamonds – in fact, diamonds were her best friends! She would have been happy to see all of the sparking and dazzling gems on the reels of this 5-reel, ‘allplay’ slot game. There are gems of every different size, shape and colour on these reels so this slot will appeal to anyone who likes things that sparkle and shine – so magpies will definitely enjoy this one! If you’re already a fan of Novomatic games and enjoy playing their other slots, like Sparkling Gems, Dazzling Diamonds and Pure Jewels, then you’ll feel like this game was made for you! If you’re not yet a fan of Novomatic’s games then Marilyn’s Diamonds is a great place to start as it’s simple to understand, yet fun to play and extremely rewarding for your credit balance! Have you ever watched one of those movies where the characters uncover some buried treasure and the camera shows you their hands running through a chest filled with diamonds? They almost look liquid when there are so many of them like that! This slot will make you feel as if you’ve jumped right in the middle of that treasure chest and that you’re swimming in the jewels. All of the symbols pay out from three or more matches and as this slot is an ‘allplay’ slot, it means then whenever they land on consecutive reels, starting from the left, they’ll pay out! You can check the paytable to view exact payout amounts according to your current bet, which you can alter by using the controls at the bottom of the screen. From the lowest-paying symbol to the highest-paying symbol, there is: the pear-drop red ruby and the rectangular green emerald; a marquise purple amethyst and a rectangular blue sapphire; a pentangular orange gem and a triangular red ruby; a trillion-shaped green emerald and a hexagonal blue sapphire; and, of course, the highest-paying symbol is a dazzling diamond! The symbols get bigger the more they are worth – so size matters in this game. On top of all these regular gem-tastic symbols which pay out from three or more whenever the identical symbols fall on neighbouring reels from the leftmost reel towards the right, there are some special symbols that shine with magic! Firstly, there is a Scatter symbol which is beautifully designed and this symbol pays out wherever it lands on the reels! Another special symbol is the beautiful Marilyn Monroe herself, who can substitute for any other symbol on the reels, which means that when she falls, not only are you able to admire her beauty but she will also increase your chances of a win! Marilyn’s Diamonds also has a unique feature which refills the reels! So, every time you spin a winning combination of symbols, those winning symbols will disappear and new symbols will fall in their places to give you another chance at getting wins, and the reels will keep on refilling as long as the wins keep on coming! 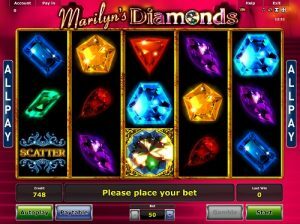 If you enjoy playing Marilyn’s Diamonds, or any other of Novomatic’s best slot games, then why not have a look to see what else Novomatic has to offer? It’s one of the top developers of online gaming software and their games are truly incomparable, and due to them being a pioneer of online casino games, they often inspire many games made by other developers! Here at NovomaticCasino.co.uk, you can read all about all of their games, including their table games and live casino games, which are incredible popular and offer much higher RTP percentages than their slots do!